This is what the toxic blue-algae bloom looked like in Lake Okeechobee from above on July, 2, 2016. 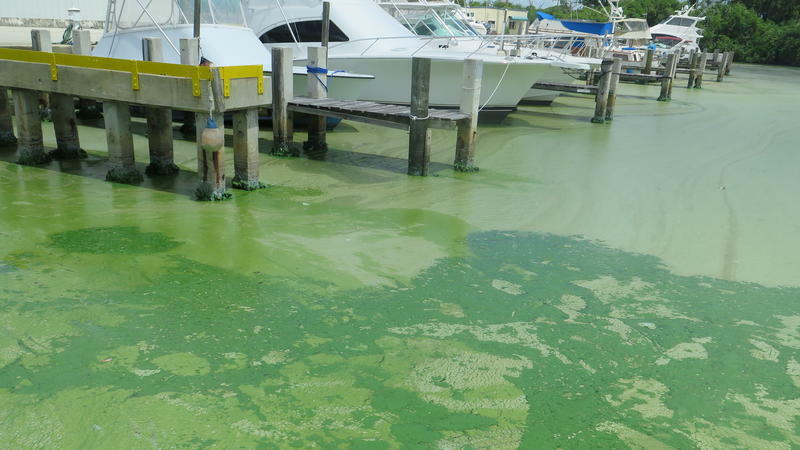 Scientists found blue-green algae again in Southwest Florida waters this week. The toxic algae has been plaguing beaches on the east coast for weeks now. Experts say this could get worse on both coasts now because of the summer heat. Everglades Foundation ecologist Steve Davis visited Lee County on Monday to observe the Caloosahatchee River up-close. 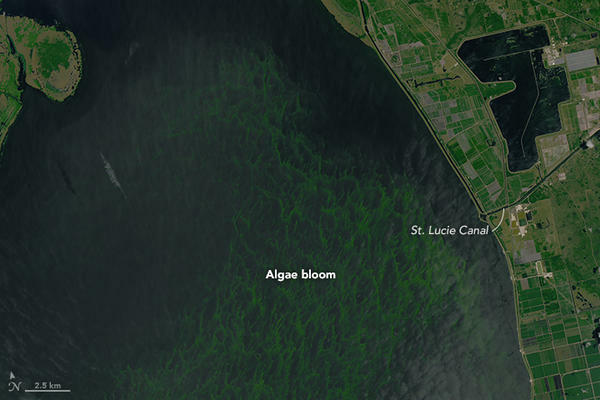 Davis said this patch of bright green algae found in Cape Coral means Lake Okeechobee freshwater releases are not only spreading toxic algae, but also dumping more freshwater along with it, allowing the algae to thrive. "Because the discharges have been going on for so long, that has made these estuaries fresher and conditions, therefore, more suitable for the growth and sustaining of these accumulations that we're seeing," said Davis. He said now that summer is here, Florida could see more blue-green algae soon. "Light intensity plays a factor in that," he said. "We might see local hot spots. And this, I think, is just an indication of the beginning of that." Davis said he thinks the only real solution is to move more Lake Okeechobee water flows south. Several environmental organizations, like the Everglades Foundation, are pushing for the state to buy land south of the lake, alleviating freshwater flows to the east and west coasts. About a hundred miles north of Miami on the Atlantic Coast, the town of Stuart is a picturesque waterfront community — with homes, restaurants and parks overlooking the St. Lucie Estuary. But in many areas now, when you approach the water, the first thing you notice is the smell. "There's no way to describe it," says John Skinner, a boat salesman in Stuart. But he still tries. "I would say hundreds of dead animals that have been baking in the sun for weeks." The toxic blue-green algae plaguing the Treasure Coast has inspired people to take action against one of Lake Okeechobee's largest pollutants: Big Sugar. 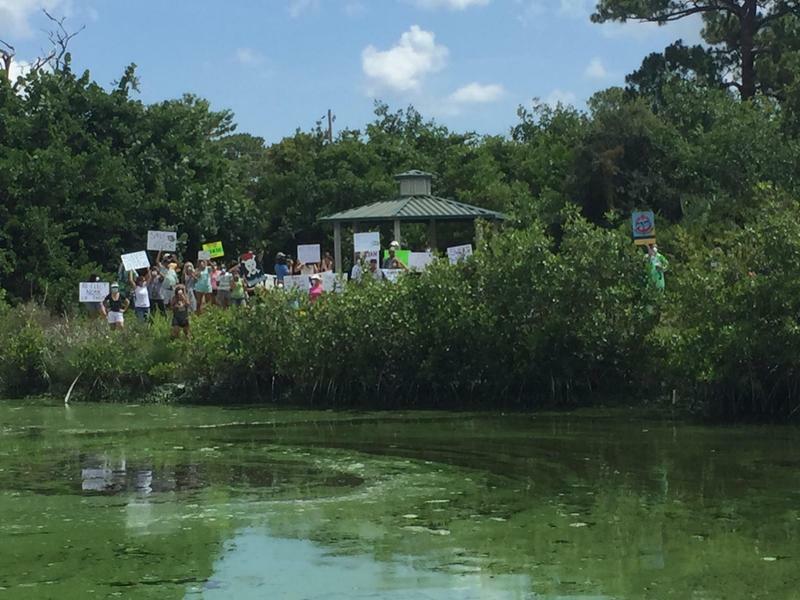 Last week, a surf shop in Stuart started a petition asking Publix to stop buying from Florida Big Sugar. “Publix is a Florida-owned company so it's got to be affecting them, the owner, in some way,” said Brent Meinhold, one of the managers of Ohana Surf Shop.